With subtle citrus flavor that perfectly accentuates the flavor of the chicken, this recipe for boneless skinless chicken breast on your Foreman Grill will quickly become a favorite. There are many ways this main course can be served. We recommend serving with a side of grilled pineapple slices, mandarin orange slices, and some fresh baby spinach. It’s also an excellent meat choice for a delicious fresh salad for lunch. Mix pineapple juice, orange juice, lemon juice and chicken broth in a glass dish. 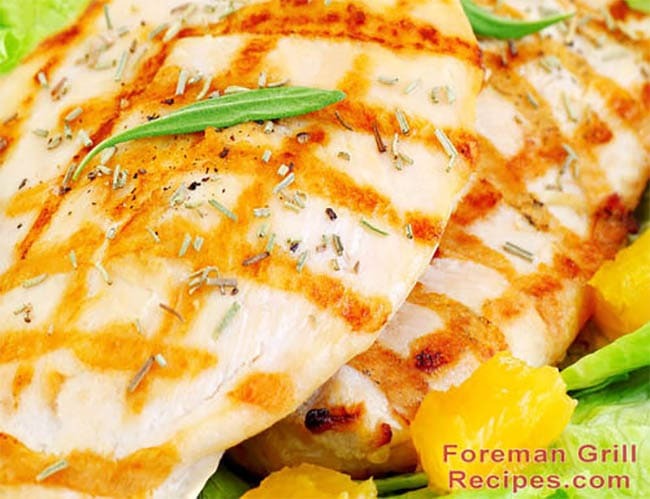 Pound chicken breasts to no more than 1/2″ thick. Place chicken in marinade and refrigerate for at least an hour. Longer if possible. Preheat your Foreman Grill for at least 5 minutes with lid closed on high setting if you have it. This is important as the hot grill will make the nice grill marks. Place chicken breasts on a plate and sprinkle with fresh ground pepper, orange zest and a little fresh rosemary. Grill for about 5 minutes or until chicken no longer pink in middle.